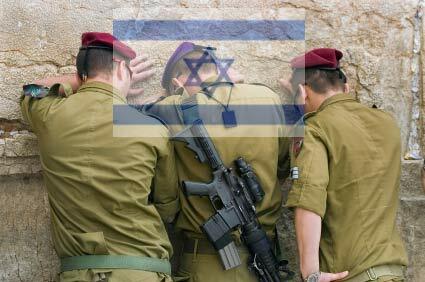 Israeli soldiers praying at the wailing wall. It is a 60-year-old country that cites its origin in the foundations of time and history. Its people lay claim to the ability to trace their roots from the first man and woman created by God, who separated them from the rest of humanity as the example nation for the rest of mankind. This is the State of Israel which celebrates 60 years as a modern nation and whose people simultaneously claim a connection to the land of Palestine going back 4,000 years – a realization of a dream which daily pushes the world towards an apocalypse in fulfillment of Judaic and Christian prophecies. The modern State of Israel comprises mainly Jews, some religious, some secular, some of a common ethnicity probably related to the ancient Israelites of the Bible, some of varying ethnicities – and Palestinian Arabs. To discuss this modern state, it is important to define the terms Israel and Jew and to trace their origins. This renaming came as Jacob was returning home with his two wives and two concubines and their eleven children (to that point) after a sojourn with his uncle that would make the modern Dallas or Brothers and Sisters television soap operas look tame. He had fled to his mother’s brother after she and Jacob had colluded to steal the birthright of Esau, the firstborn of the family. Jacob eventually had 12 sons and a daughter and the boys sold Joseph, one of their brothers, into slavery in Egypt. A famine in Canaan forced Israel and his sons to go to Egypt on the invitation of Joseph who had grown to become a high official in the Pharaoh’s government. After several years in Egypt where the descendants of Israel had lost favour and been enslaved, Moses a descendant of Levi, one of Israel’s son’s, rebelled against his upbringing in the Pharaoh’s palace and became a leader of the descendants of Israel. Moses and his brother Aaron were to take the Israelites to their old land of Canaan that God had given to their ancestor Abraham. The land was now occupied by others, Philistine Canaanites, who God is said to have ordered them to wipe out. The Israelites conquered the land, divided it among the 12 houses of descendants from Jacob (tribes) and built their cities and places of worship. Jacob had told his children that Judah was to be the ruler among them and that the sons of Levi were to be the priests. By the time of a monarchy among the Israelites, David was the first Judaic king and his son Solomon built a temple at Jerusalem, the Israelite capital, as the state centre of worship. The biblical accounts have not been confirmed by archeology. Israel experienced civil war and was split into kingdoms Israel (with 10 tribes in the north of Canaan) and Judah (some Levites and some Benjaminites) in the south, and was invaded by various countries including the Assyrians, Babylon and Persia. The Assyrians drove Israel into exile and they became scattered throughout the then known world and were/are referred to as the 10 lost tribes. The Judahists while dismantled as a kingdom by the Persians and then the Romans, remained around Canaan (Palestine) before being exiled, this time by the Romans. It is this remnant who became known as Jews, from whom Jesus of Nazareth sprang, whose doctrine was promoted to non-Jews, primarily by the Benjaminite, Paul of Tarsus. The Hebrew noun Yehudi (plural Yehudim) originally referred to the tribe of Judah. After the split of Israel the Southern Kingdom began to refer to itself by the name of its predominant tribe, or as the Kingdom of Judah. The term originally referred to the people of the southern kingdom, although the term B’nei Yisrael (Israelites) was still used for both groups. After the Assyrians conquered the northern kingdom leaving the southern kingdom as the only Israelite state, the word Yehudim gradually came to refer to people of the Jewish faith as a whole, rather than those specifically from the tribe or Kingdom of Judah. The English word Jew is ultimately derived from Yehudi. The first use of the term in the Bible to refer to the Jewish people as a whole is in the Book of Esther. The vision of a reconstituted Israel as part if a redemptive process straddled the Israelite way of life that came to be known as the religion Judaism as well as its offspring, Christianity. Both relate a reestablished Israel to the return of a messiah to champion good over evil in a final showdown and the Christian vision presented by John the apostle of Jesus, in his book of Revelation, contains prophecies that are interpreted by messianic Christians as representing the end of time as we know it. The Jews who survived in history, have found themselves persecuted in most countries they have lived, primarily across Europe since the spread and decline of the Roman empire. For example, they were deported from Spain and Portugal around the time of Columbus’s explorations. They were victims of Russian pogroms or officially sanctioned massacres and primarily in response to these persecutions in the 19th Century a Zionist movement began with an aim to recreate a homeland for the Jews. In 1896, the Austro-Hungarian journalist Theodor Herzl, credited with founding modern Zionism, published Der Judenstaat (The Jewish State), with his vision of such a country. While some Zionists were of a religious bent, the movement was more in tune with the nationalism of the era and by the 1910s, influenced by the evolving socialism. After World War I, the League of Nations approved a British mandate over Palestine with the intent of creating a “national home for the Jewish people”, but it was slow in evolving. Hitler’s “Final Solution” in which he attempted to annihilate Jews and ended up murdering some six million in Europe during World war II’s holocaust (burnt completely), prompted the world to act on their behalf to establish a homeland. Jews from Europe and around the world began migrating to Palestine in greater numbers. The population of the area then was predominantly Muslim Arab, while the largest urban area in the region, Jerusalem, was predominantly Jewish. In 1947, the United Nations approved the partition of Palestine into two states, one Jewish and one Arab, a plan rejected by the Arab League. However, on May 14, 1948, the Jewish provisional government under David Ben-Gurion declared Israel’s independence. A declaration of a “State of Palestine” was approved on November 15, 1988, by the Palestinian National Council, the legislative body of the Palestinian Liberation Organization (PLO) and rejected by the State of Israel. It would trigger the start of almost ceaseless hostilities in the Middle East with Arab and Muslim countries in the region and beyond supporting the native Palestinians on the one hand and Western and Christian countries in the main backing the Israelis. In 2008, question of who owns the Palestinian land remains as fresh and divisive as the day Moses collected the Commandments. And sorrow and sighing have not fled. What do you think of the Arab Israeli conflict? Share your views.